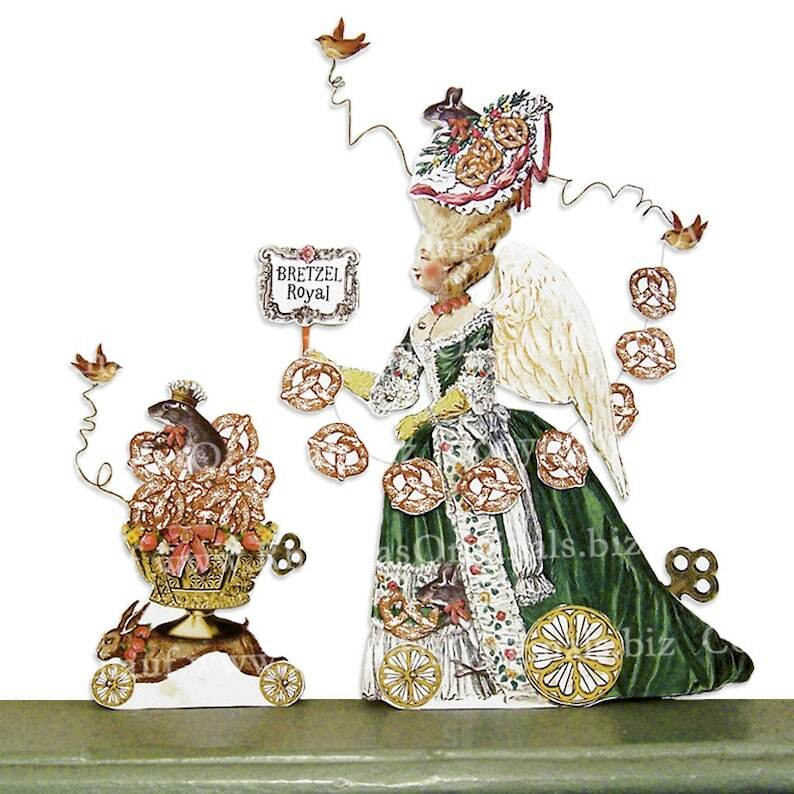 This Pretzel Angel is one of the Marie Antoinette digital download paper doll characters that makes up my vintage French paper doll parade. Simply print out in color, cut, assemble, and stain the card stock character with coffee to make it look like an actual antique! Images are clearer than Etsy photos and watermark will be removed. All characters print two sides and stand on their own, so they can be used in the center of a table and enjoyed from all sides. They also look good running across a mantle. They can also be hanging decorations (instructions included). The characters were painstakingly created in Photoshop using actual vintage French images. Collect them all! MA16 - Angelina is the Pretzel Angel. Wheels spin. Arm moves. Some parts dangle by threads. Did you know that pretzels are connected to Lent? Google online to learn about pretzel history and to find the "pretzel prayer!" There really is one! Youtube.com has great pretzel making videos. BUYER NOTES: Digitals are not returnable. You will get jpg files and how to instructions in pdf. No mass production. You cannot sell or give away the digital files. You cannot sell printouts of the digital files. You can sell the finished product that you made yourself.on a small scale. See policies before purchasing.